It’s been a few weeks since I powered through the Netflix series Unbreakable Kimmy Schmidt, and while I certainly enjoyed the manic silliness of the whole show (which was created by the 30 Rock folks Tina Fey and Robert Carlock), the thing I find myself thinking about the most is that amazing little theme song. Basically, I love it because it’s super catchy and perfect for the series, but also because it expands the horizons of what a theme song can be. These days, most theme songs seem to be limited to a couple of varieties: stylized (think: Game of Thrones or Mad Men), atmospheric (Walking Dead, House of Cards), or even none at all (a lot of the network sitcoms). The Kimmy Schmidt theme adds a fun new wrinkle to the idea of theme songs: that they can actually be part of the show’s story. So here’s the deal – Episode one opens with the adorable Elle Kemper (from the later seasons of The Office and Bridesmaids) and three other women locked in a bunker, held captive by the demented leader of an apocalypse cult. Then things start to happen quickly, we see SWAT teams kick in the door and rescue the women from the bunker. We then cut to the media’s ubiquitous coverage of this event, complete with an interview with a guy named Walter Bankston who lived in a trailer next to the bunker. Then Bankston’s interview morphs into an auto-tuned viral video of itself, much like the “hide your kids, hide your wife” guy in that video that everybody saw from a few years ago. This is kind of crazy – somebody please correct me if I’m wrong, but I don’t know that there has ever been an in-story justification for a theme song on a TV show before. At least not on this level. It all gets even crazier when Bankston shows up again later in the series. It’s funny and surprising that they would double down on what could have been a throwaway gag in such a huge way. But the theme song concept fits with the series – Kimmy Schmidt excels in fully committing to jokes that are protracted or have very deep concepts. Just one example would be Kimmy’s roommate Titus, played by Tituss Burgess. Titus is an actor, and at one point he mentions that he needs new headshots because his old ones are dated. I have a lot of actor friends, so I know that this is a real thing. If you grow a beard or get a haircut, you need to get a new headshot. So, Titus makes this remark about his headshot and casually holds it up. 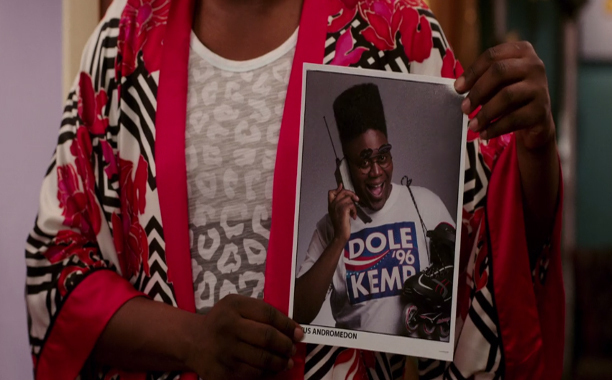 In it, he’s wearing a “Dole/Kemp” shirt from the 1996 presidential election, flip-up sunglasses, and a Kid ‘n Play style flattop, while talking on an old-school cell phone and holding a pair of roller blades. Okay, maybe it’s kind of an easy gag, but you have to appreciate the sheer DENSITY of the joke going on in that image. The show’s commitment to that bit was such that they found all those props and did a photo shoot and got that headshot printed before even shooting the scene. The theme song is sort of an extension of the show’s bent sensibility and devotion to its own silliness. The show was originally developed for NBC, but the network passed on it and it’s easy to imagine why. There is nothing inherently funny about real-life cults where the misguided leaders mistreat or imprison their followers. But one of the chief necessities of comedy is that it must be brave, surprising, and uncompromising – Tina Fey and Robert Carlock have shown that they understand that on 30 Rock and they certainly do here. To reach the levels of zaniness and optimism they are going for with this show, they almost have to have the macabre stuff about the cult at the beginning so it doesn’t play as sappy. Elle Kemper, as Kimmy, is a big part of why this works. She does a bang-up job of playing both the naiveté of someone who has been cut off from culture for more than a decade and the enlightenment that comes from surviving a harrowing experience. There is a scene later in the pilot of her cackling wildly as she uses a motion activated sink and hand dryer in a public bathroom. This should play as the country-girl-comes-to-the-big-city thing we’ve all seen a hundred times, but Kemper is so genuine and likeable that it completely shatters that cliché. At one point she reveals her personal philosophy, which is that anyone can endure anything for ten seconds. And then after that you just endure another ten seconds and another, etc. We see this enacted in a flashback to the bunker, where she has to continually turn a crank. Each time she counts to ten, we see her grow weary, but then when she resets at one she is totally refreshed and ready to continue. Kemper plays the transition hilariously. I watched the whole series over the course of maybe three days and never once skipped the theme. It’s not only ingenious, exuberant and ear-wormy; it’s thematically resonant. The “hide your kids, hide your wife” guy video is something very scary and troubling – a home invasion – that has been made into something very funny. 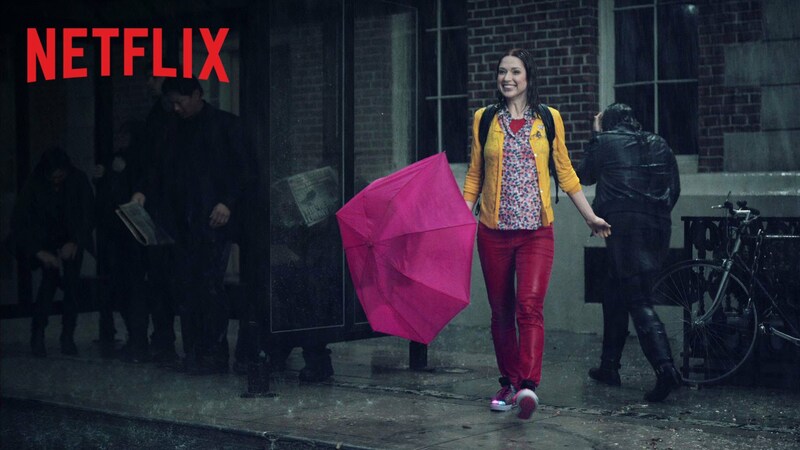 Unbreakable Kimmy Schmidt is that too and that’s one of the show’s greatest strengths.